When you closely look back at the previous campaign of MDFA Elite Division, whether it is a goal-scoring chart or a collective performance index, it would be always dominated by Air India and ONGC’s players. Well, this season, the gear shifted towards the other path. For the very first time in years, the usual suspects were challenged and tested to their limits, quite evidently by Union Bank of India (UBI) who finished their season 3rd just below eventual winners ONGC and runners-up Air India. If there is one person who guided the Bankers in the right direction, it was striker Scott Ray D’Souza. Joining UBI from Central Bank of India (CBI), the 23-year old had already set his sights at the top of the scoring charts even before the start of the season. His impeccable physique and lethal finishing helped Scott to score ten goals this season as he finished the 2017-18 campaign as the top-scorer. “My target was simple this year, to finish at the top of the scoring charts. Fortunately, I achieved that with 10 goals this season and finish 1st in the league. That was exactly my objective at the start of the season.” In an Elite Division game against M.S Police, Scott had scored four past the Polices in a 6-0 rout. In just four games, Scott had bagged six goals but soon a dry spell followed. 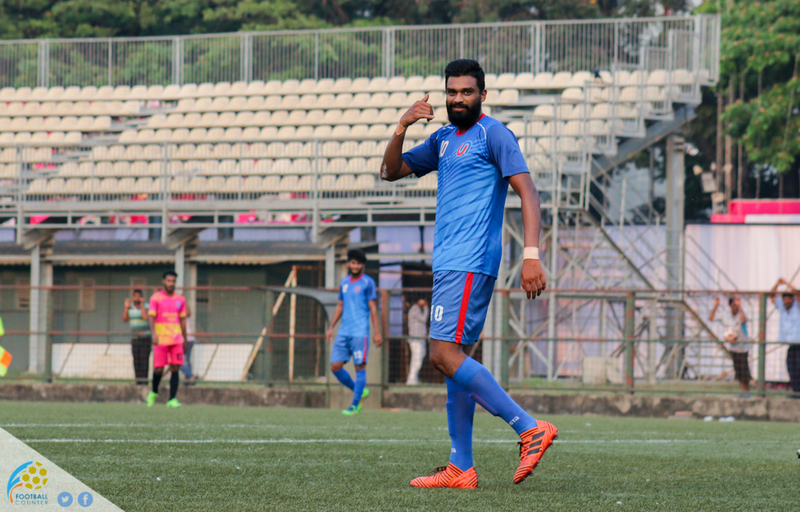 New signing Ranjeet Pandre, who eventually went on to win the best striker award was made as the target man for UBI to help him settle into the new environment. “The start of the season was great. As the season progressed, my role at UBI also changed. We had to get Ranjeet more into the game as he was not comfortable with his previous role,” Scott told. To put into perspective, Scott wasn’t the only player to had a great season. Attacking compatriots Bryce Miranda, Ranjeet Pandre, Valentine Pereira, dynamic players including Dion Menezes and Sherwyn Chang, all were equally good throughout the campaign which was also the reason behind UBI’s fascinating run in the RCF Nadkarni Cup where they finish second behind Air India. “Everyone knew what we were capable of and everyone fought hard for a place in the starting eleven. The competition within ourselves developed a winning mentality in the dressing room. Finishing 3rd in the league and runner-up in RCF Nadkarni Cup is just a motivation for us to do better next season. No one likes to finish 3rd, especially me. I like to be on the top of the chart in whichever competition I participate. My ambition? I take football very seriously and I hope to represent Mumbai City FC one day,” Scott concluded.